I am always a little dubious when it comes to comedy. Mainly because I can be a little slow when actually getting the jokes…there’s usually on average a ten second delay in my response, to which point the comedian has moved onto their next joke leaving me playing catch up. Sometimes I just laugh Friends style following the cue from everyone around me. I think the Hubster has caught onto this as he just looks at me as if to say ‘I know you didn’t get that one!” Two comedians that I really like (and get their jokes on time) are Micky Flanagan and Kerry Godliman. Both of which we have seen live before and we were lucky enough to see Kerry perform again last weekend, along with four other brilliant comedians at the Crack Comedy Club’s Saturday Night Five event in Charing Cross, London. 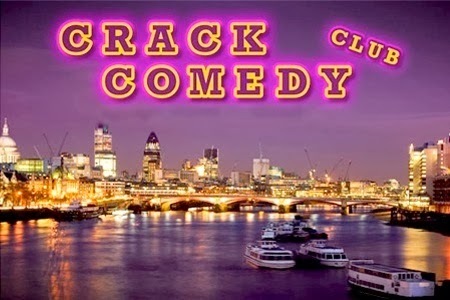 Crack Comedy Club is in it’s 11th season and is fast becoming one of London’s most hilarious comedy gigs. Held in intimate venues around London, you are treated to performances from up and coming newbies to some familiar comedy geniuses, all making their mark on the comedy scene. 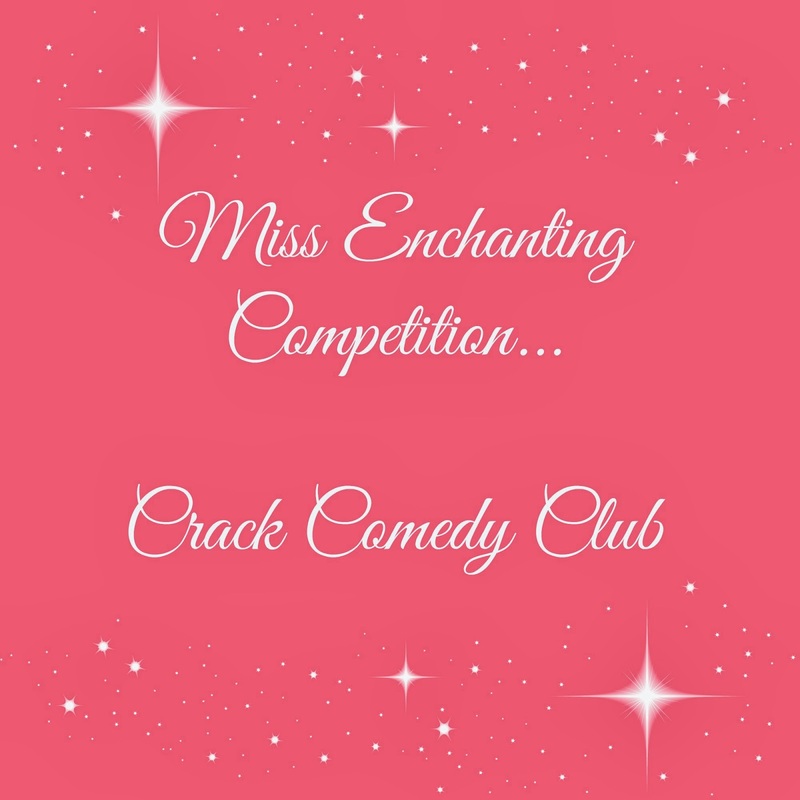 I was lucky enough to win some complimentary tickets to attend another future event and in the spirit of being perky and positive in a miserable January, I would like to pass on two free tickets to one of Miss Enchanting’s lovely readers! All you have to do is enter via the Rafflecopter below and in keeping with the funny theme, I’d like you to tell me something that has made you laugh already in 2014! It’s that easy…unless you are completely down in the grumps and you haven’t flashed your pearly whites in 15 days…? The prize is two free tickets a Crack Comedy Club event held at their Charing Cross venue in London. The winner can choose from a selection of dates as to which event they attend. Entries: Each reader can enter up to three times using the Rafflecopter, by answering the question provided in the comment section, liking Miss Enchanting’s Facebook page and following Miss Enchanting on Twitter. For those of you already liking and following you will aromatically get a free entry. UK Entrants over 18 only. Apologies to my overseas readers…I will make it up to you one day! Competition closes on Friday 24th January 2014 at 12.00am. My 3 year old daughter makes me laugh every day she's a joy. Loved Vic and Bob's House of Fools this week too, they always make me laugh. Watching my aunts dog that we are currently looking after, jump up and down while trying to hug me, and just generally being hilarious! My daughter is a real comedic and makes me laugh everyday. Politician David Silvester claiming we've had floods as David Cameron has allowed Gay Marriages. Mrs Brown's boys always has me laughing. My one year old son makes me chuckle everyday. My great-niece (she was 2 in October) telling her Mum's boyfriend "Mum says I'm allowed" when asking for some of his chocolate lol. The first time I tried the inhaler the doc gave me for my chest infection I got the giggles as I couldn't do it right and my boyfriend was trying to show me!!! Not good when my chest hurts!!! Waiting at a checkout in a packed supermarket with my toddler. Me: What would you like for a snack when we get home. My 2 year old: Cokporn please! I love Cokporn! Everyone within earshot burst out laughing. Helping my mum find a hairdryer set on Boots.com that she had seen in store. Me: Was is it the sale Mum? Mum: No! It was in a case!! My 11 month old daughter trying to catch the cat! My flatmate getting yellow dye from his new hat all over his face and not realising… The fact that I met him at the station and he couldn't figure out why people were looking at him strange made it all the funnier! Watching a squirrel trying to raid the bird feeder and failing…. and I thought squirrels were asleep this time of the year!